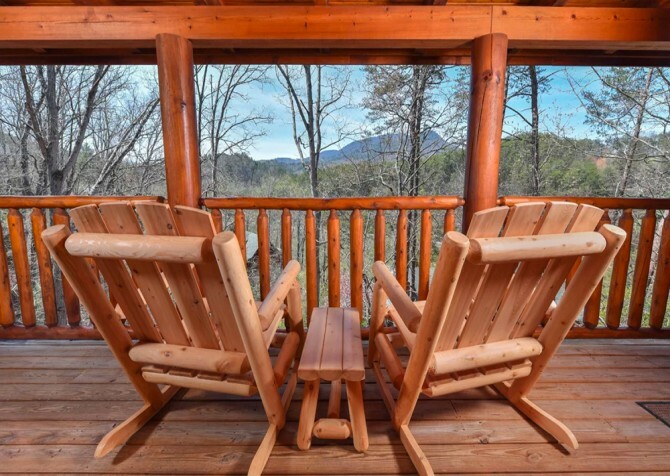 If you want the excitement of a cabin trip but still want the luxury that comes with a gated resort community, your expectations and Memory Keeper are a match made in vacation heaven! Bear Creek Crossing Resort is the perfect combination of seclusion and a warm mountain community. 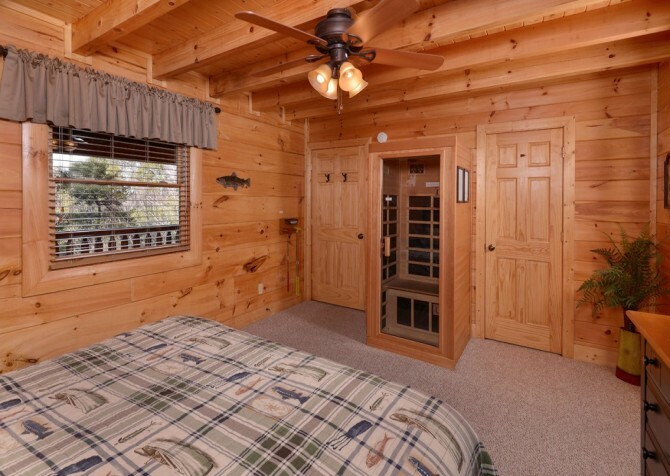 Want to coordinate with a group too large than what can comfortably fit in one cabin? 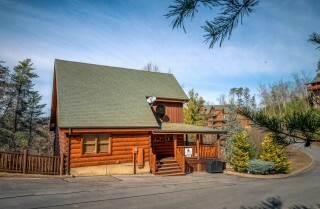 Maybe you are planning a ladies’ or men’s church retreat, or maybe a big, multi-family reunion is long overdue. 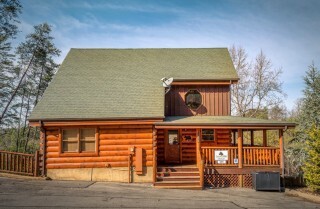 Book Memory Keeper and Casa di Amore, another cabin within Bear Creek Crossing, that are walking distance of one another! 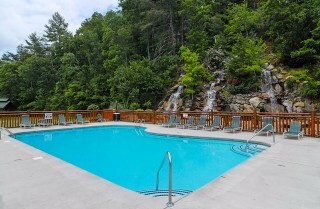 The resort community even offers a large mountain style clubhouse, open to groups by reservation. 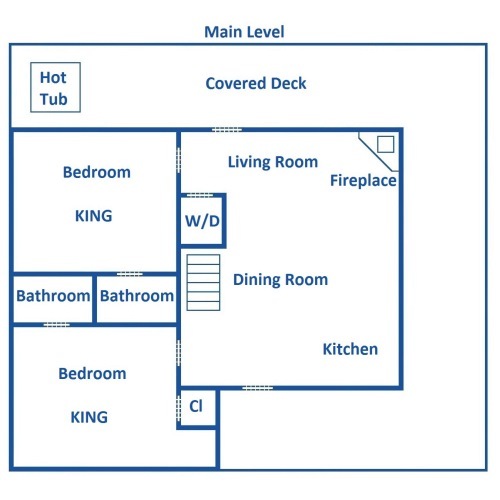 Memory Keeper has paved parking, easy stair access, and the bedrooms, kitchen, living, and dining rooms are on the main level. The charm of Memory Keeper starts with the classic log exterior and extends inside with comfortable spaces and mountain details. You can unwind in the 2 large, private bedrooms with king-size beds and their own TVs, whip up meals in the fully equipped kitchen, sit down for family-style meals at the 6-person table, or cozy up on cool mountain nights in the spacious but homey living room. The high ceilings and numerous windows allow ample sunlight to make days in the Smoky Mountains even sunnier. You’ll love relaxing in the natural elements of the warm wooden structure, while being afforded everyday conveniences of the modern, sleek black appliances and furnishings. 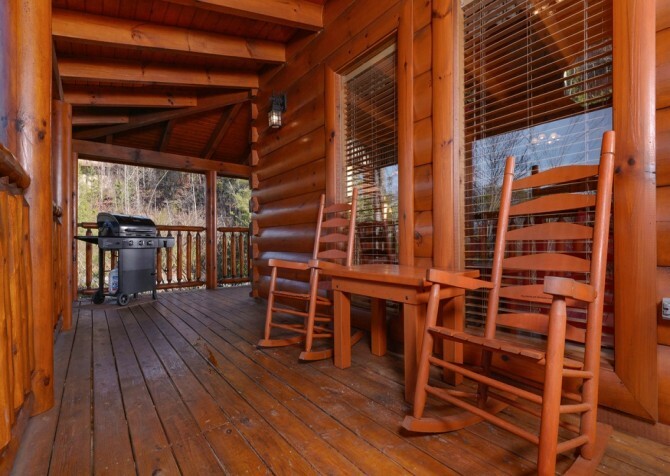 Memory Keeper is settled into a prime location amid the atmosphere of this secluded mountain community, less than 6 miles from the hustle and bustle of downtown Pigeon Forge. Attractions like the Smith Family Theater, Country Tonite, and the Titanic Museum Attraction are less than 5 miles away, meaning you’re always close to the fun! Plus, dozens of restaurants and shops offer something for everyone just a few miles from the cabin. 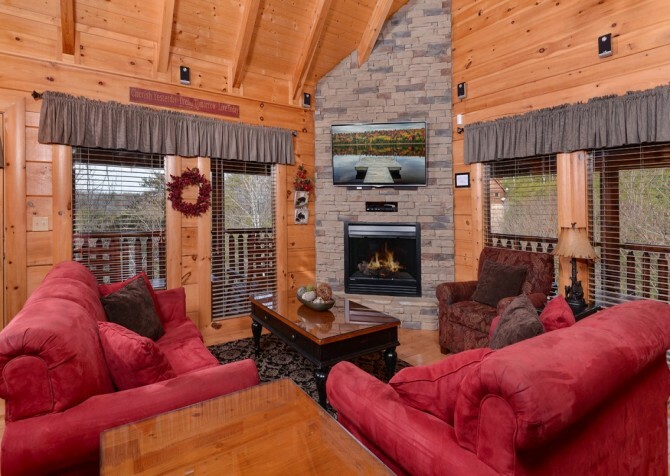 Memory Keeper’s living area is a comfy and intimate space for you and your family to come home and relax after playing putt-putt golf and swimming in the warm Tennessee sun. Or cozy up on the large comfy couches in front of the electric stone fireplace in fall and winter. Put on a movie (with a DVD player in the cabin) or pick something on the HD Satellite service to play on the large 51” flatscreen TV with surround sound. Want to skip the screen and hang out together? Just dig into the board game collection in the cabin and play together on the coffee table. 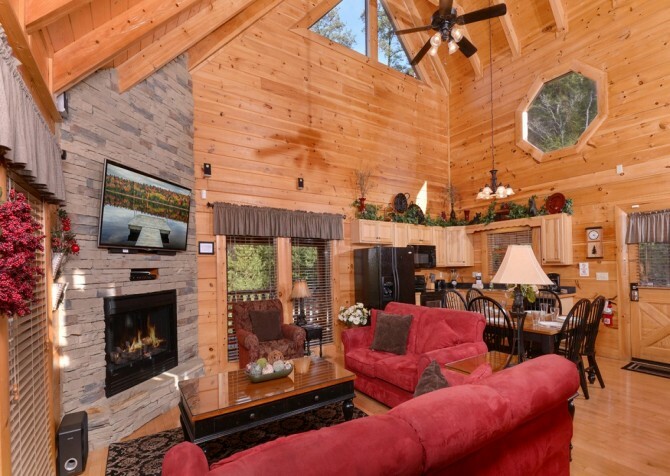 Read a book or listen to your favorite podcast while you lounge on the couch with views of the mountains and forests through the large windows. 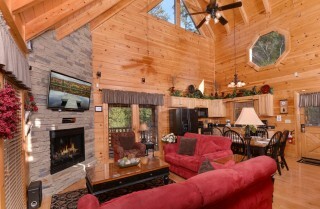 Surf the web via the high-speed wireless internet in the cabin. 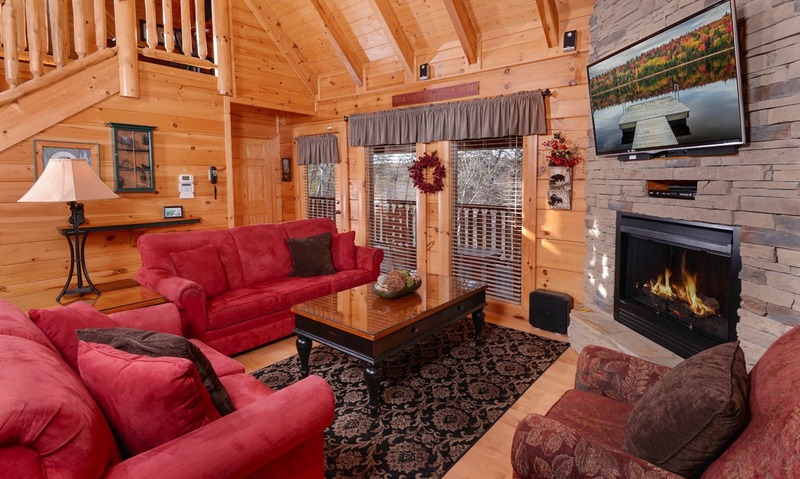 After a full day visiting Dollywood or whitewater rafting or tubing down the Little Pigeon River, the couches are prime napping spots you may have to beat the kids to! However you spend your time here, you’ll feel at home in Memory Keeper. 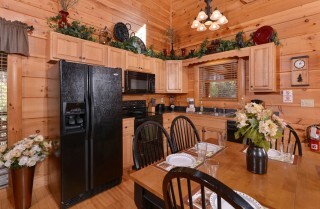 The fully equipped kitchen in Memory Keeper makes quick little meals and large 3-course dinners easy to whip up. 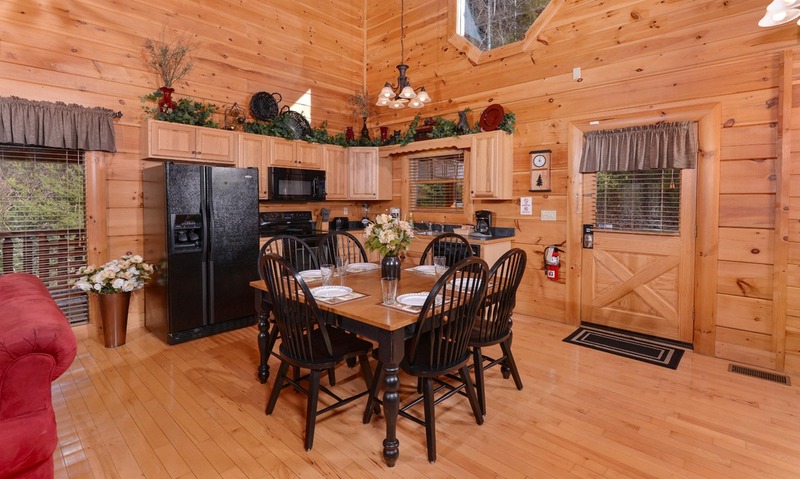 Deliver the meals plated or set up a family-style meal at the dining table. No matter what cuisine you choose to make, this kitchen is stocked with plenty of tools and appliances, along with a spacious refrigerator for all your groceries and drinks. Take advantage of the coffeemaker for your much-needed jolt in the morning, or use the blender to make smoothies for the kids. Surprise everyone with a pancake breakfast using The Old Mill General Store’s superb pancake mix; just stop by while you are out exploring Pigeon Forge! 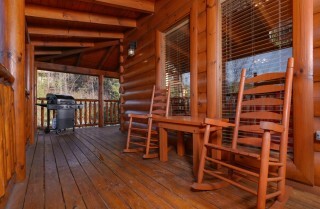 And don’t forget to utilize the grill on the porch to make delicious fire-grilled steaks, kabobs, or burgers! Just a few steps from everything you need for your meals is the dining area. The large wooden dining table seats up to 6 guests. 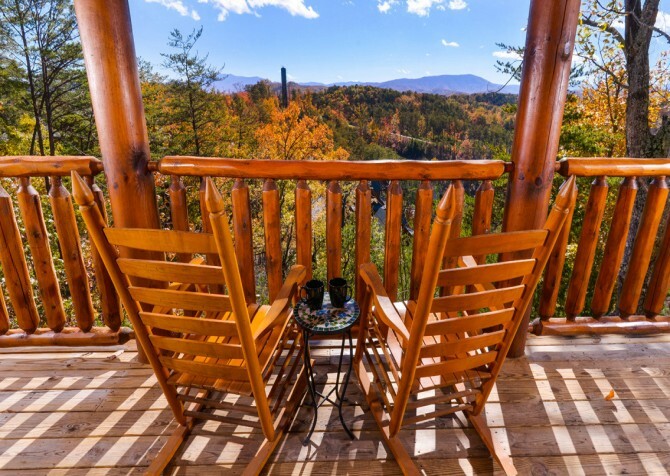 Enjoy your meal as you laugh and recall how nervous everyone was to go ziplining and how beautiful the views were. Impress that special someone with a candlelight dinner in the dim glow of the flames from the fireplace. The ambiance of the room is natural and lovely with all the mountain cabin décor and accents. Best of all, the cleanup is made easy, too! Just rinse and put the dishes in the dishwasher before calling it a night. Though you may never want to leave your mountain paradise, you won’t want to miss out on some of Pigeon Forge and Gatlinburg’s famous eateries like The Old Mill Restaurant and Bennett's Pit Bar-B-Que, and more.. 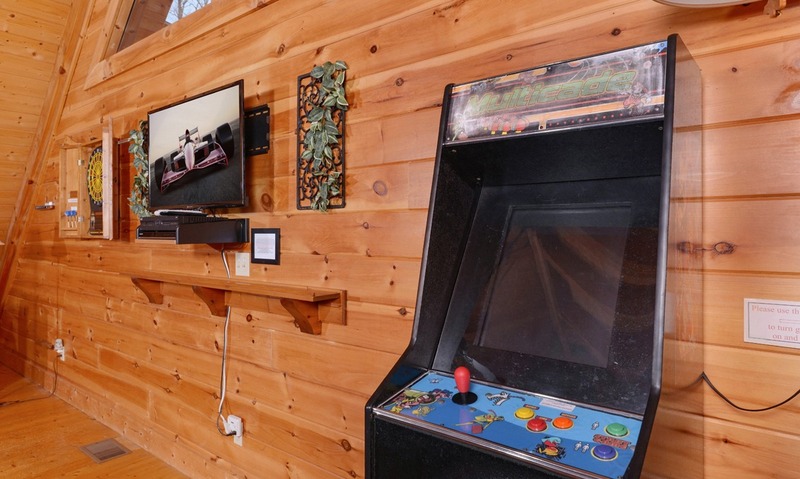 If you want to take a day to relax and stay at the cabin, everyone can easily stay entertained upstairs in the awesome game room. The loft area upstairs has it all: a full-size pool table, miniature football game, foosball table, flatscreen TV, dart board, checkers table, books, a large couch, and even a large, old-school arcade game! 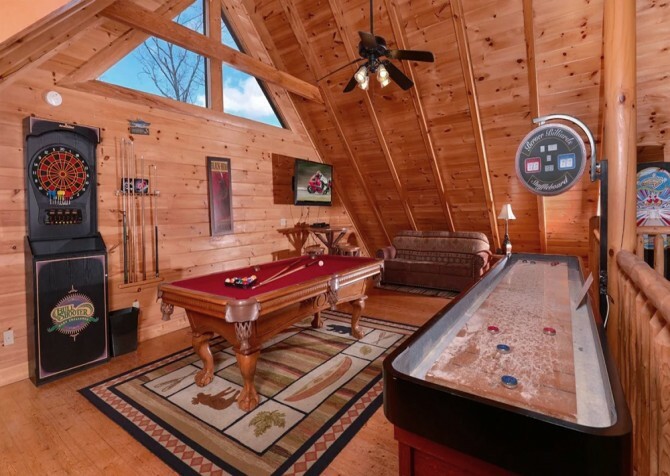 No one on your cabin trip can complain of boredom with this game room just upstairs. 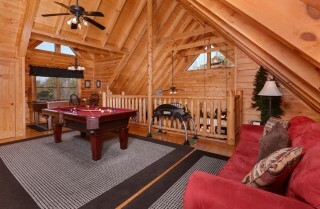 Put on a football game using the HD Satellite stations and play some pool. Watch TV from the couch while the kids play around with arcade games and foosball. 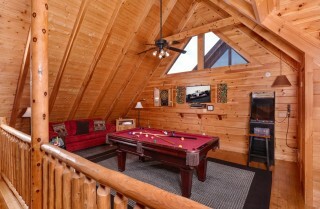 Plans get rained out? Create a miniature “Olympic Games” and have the kids compete in darts, football, and more. 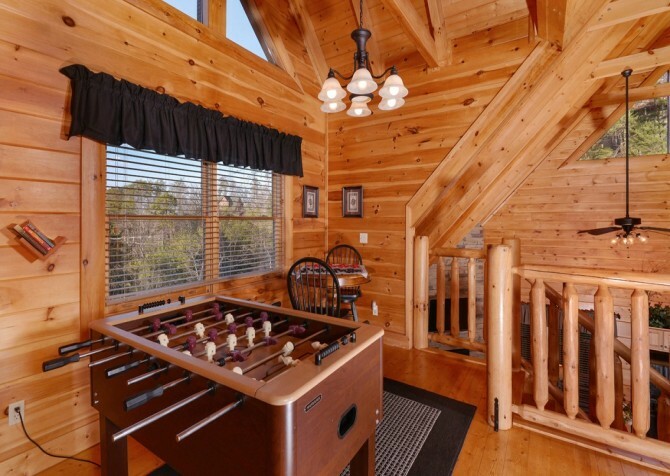 There won’t be any gaps in the vacation itinerary with plenty to do in a game room like this one! 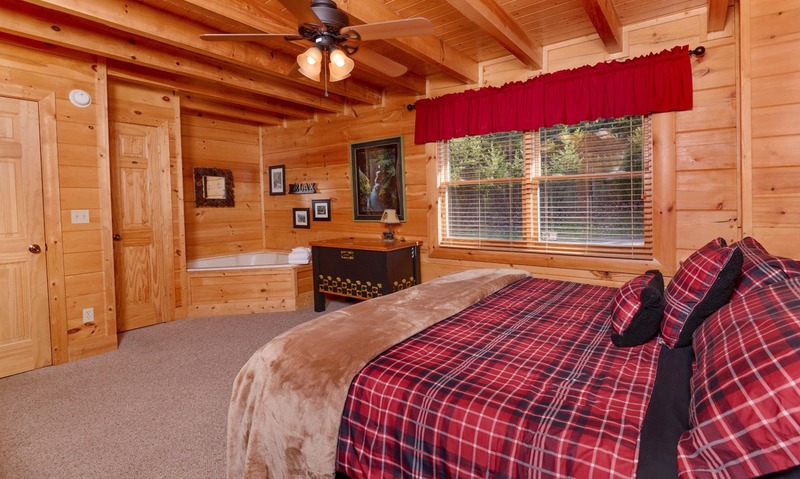 After all the excitement of the day, hiking to the waterfalls at Laurel Falls, or coming home with full shopping bags from your excursion to The Island in Pigeon Forge, come home to rest in the spacious rooms on one of the king-size beds. Each room has cozy cabin décor and plenty of storage and closet space to unpack your suitcases. Both rooms also have their own TVs (with satellite) and their own bathrooms. While the rooms share most of the same perks, you may have to take time to decide who prefers the indoor jetted tub or the indoor sauna! Step straight into the private sauna inside one of the bedrooms to relax your muscles from all the walking of the day. 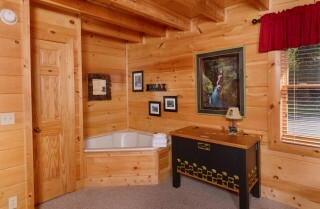 Or maybe you prefer a luxurious bath in the jetted tub secluded from the rest of your party. 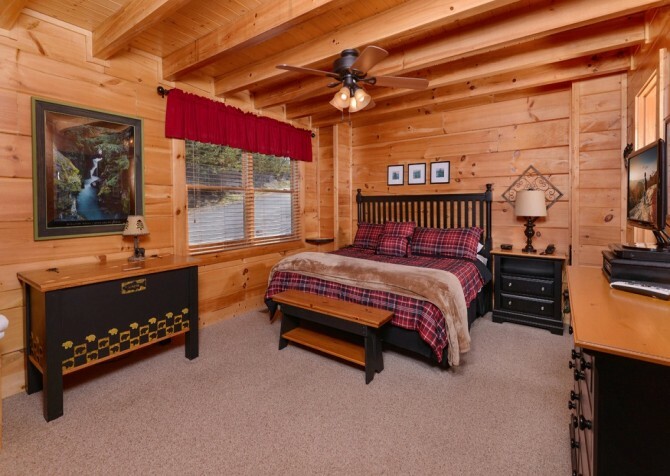 Either way you like to unwind, both bedrooms are spacious and pleasant. Have a few more people? 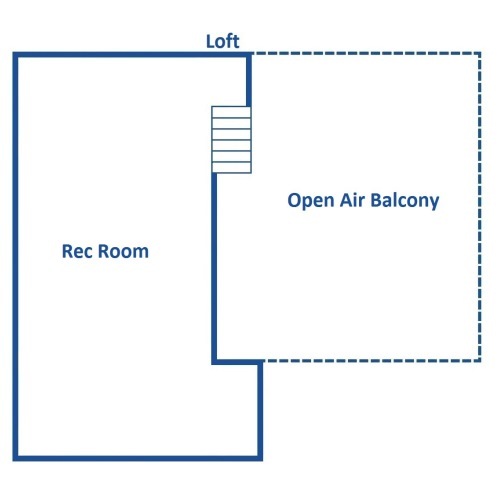 Memory Keeper also has 2 queen-size sleeper sofas. 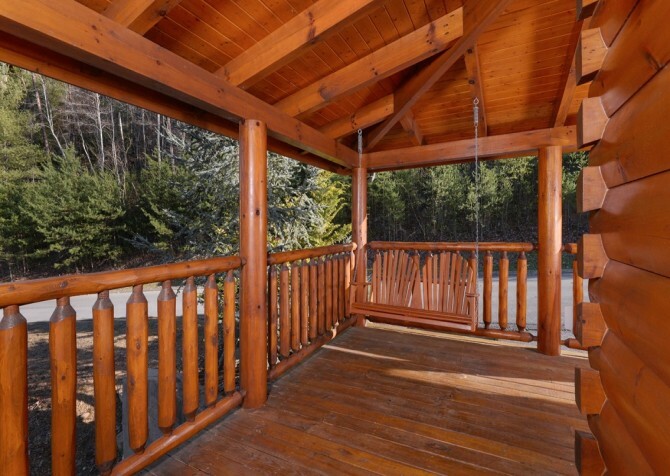 Memory Keeper’s wraparound porch will give you plenty of reasons to leave all the indoor amenities and soak up the mountain surroundings. Settle into one of the rocking chairs with your morning coffee and enjoy the sun coming up over the scenic Smoky Mountains. 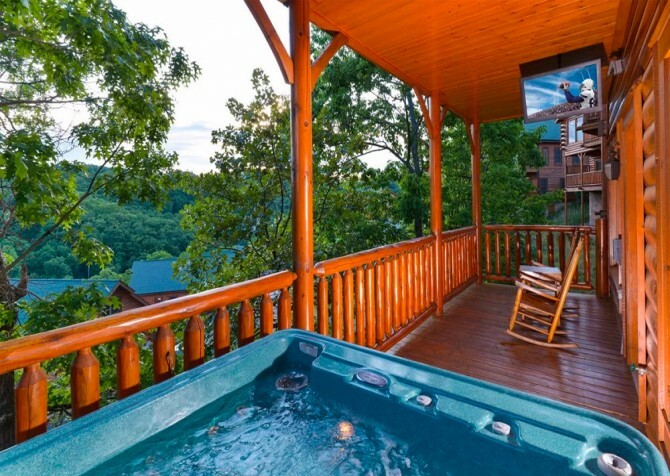 Bring home a bottle of Smoky Mountain Winery’s award-winning Muscadine wine and slip into the jetted tub for a romantic time. 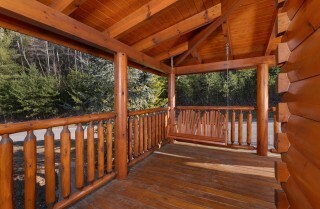 Or swing on the wooden porch swing as you chat with your group’s grill master. The serene tree-studded setting will offer a place to rest and rejuvenate after a busy week. At Bear Creek Crossing resort, you’ll enjoy the perks of a gated cabin community, including paved roads throughout the resort and indoor and outdoor pools! 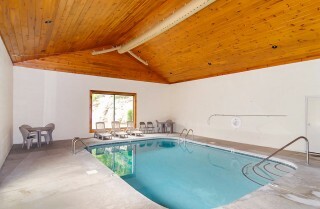 When it’s rainy, head to the indoor pool to splash around or get in a few laps. On hot summer days, enjoy cooling off with the kids at the outdoor pool that boasts a beautiful backdrop of cascading waterfalls. There are plenty of poolside chairs to soak up some sun while the kids splash around in the water. 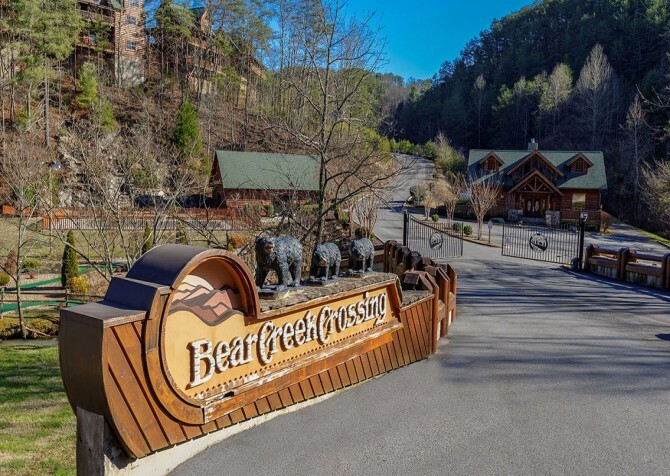 Memory Keeper and Bear Creek Crossing is hidden quietly in the mountains between Pigeon Forge and Sevierville, so while you are away from all the lights and sounds of the cities, you are still positioned perfectly within 6 miles in either direction to each location. 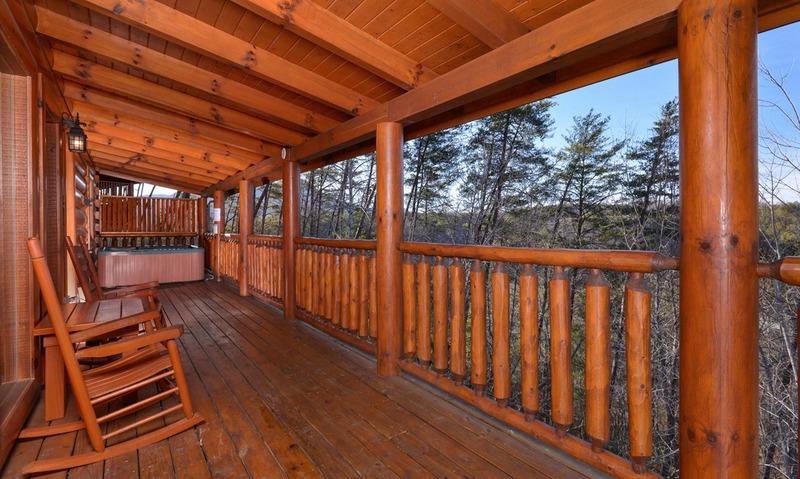 Sevierville has plenty of shopping and outdoor adventures to be had as the bridge between the Tennessee Valley and the Smoky Mountains. Visit Foxfire Mountain Adventure Park and walk across the country’s longest suspended rope bridge amongst numerous waterfalls! Ever ridden an ATV? 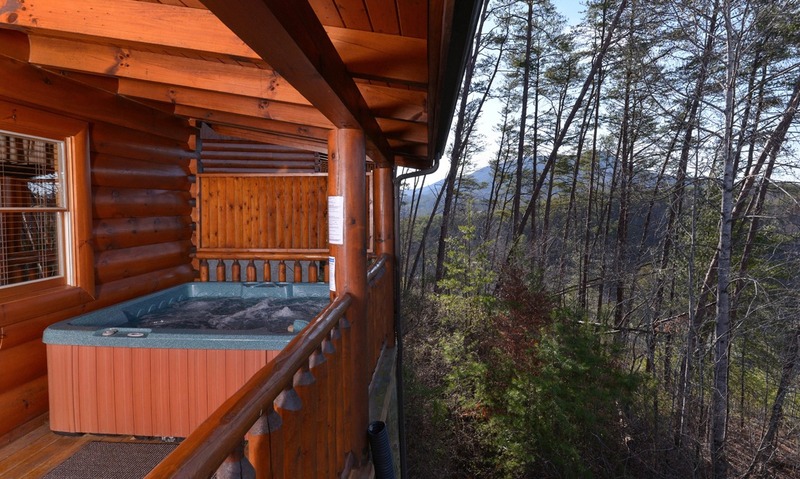 Hold on tight and roll through creeks and through forest trails on Foxfire’s 8-wheel ATV! 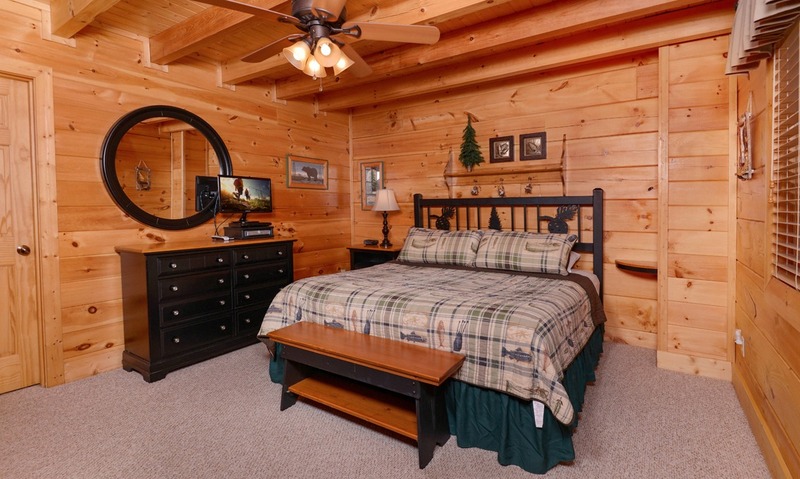 Go shopping at the large Tanger Outlets, where you can find all of your most-loved brands. Pick up handbags, shoes, electronics, toys, home goods, and much more – all at discount prices! Get a good laugh with the family at Pigeon Forge Comedy Barn, where you can watch goofy, country clowns try to best one another and a cat that can balance while walking on a disco ball! 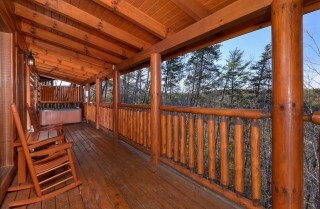 "Perfect place to spend time with family, amazing views, super clean and well maintained. We loved this place and is highly recommended for everyone!"